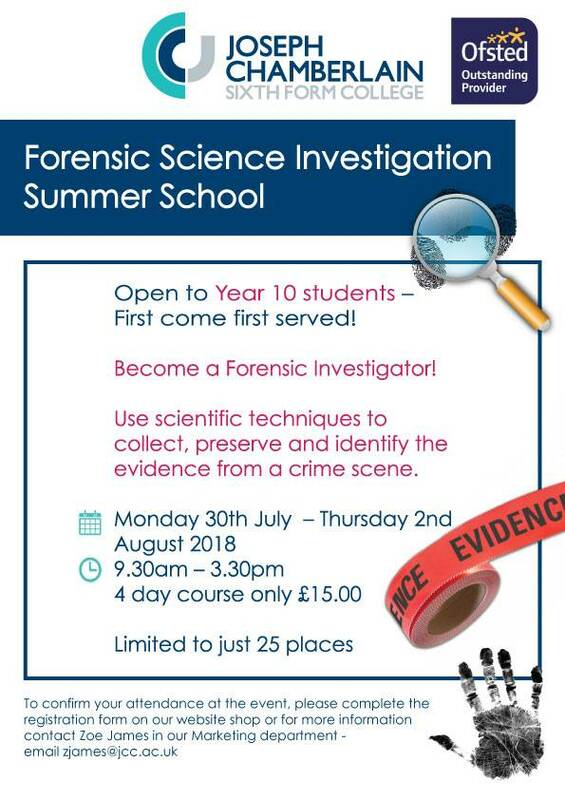 Between Monday 30th July – Thursday 2nd August 2018, Joseph Chamberlain College will be hosting its annual Forensic Science Investigation School. This opportunity is available to students who are currently in Year 10. Participants will adopt the identity of a Forensic Investigator and to use scientific techniques to collect, preserve and identify the evidence from a crime scene and keep a record of what has been collected. They will then spend time analysing the results, compare them to samples taken from the “suspect” and most importantly have a fun and enjoyable time doing science. At the end of the four days, each student to successfully complete the course will receive a certificate.